Nov 25: A fair 10-sided die with one face labeled 1, two faces labeled 2, three faces labeled 3 and four faces labeled 4 is rolled. What is the expected value when this die is rolled? Nov 26: Ana has a bowl containing two square tiles, one with side length 2 cm and the other with side length 3 cm. She randomly chooses a tile from the bowl. The expected value of the area of the chosen tile is the sum of the products of each tile’s area and its corresponding probability of being chosen. If the probability of choosing a particular tile is proportional to its area, what is the expected value of the area of the tile Ana chooses? Express your answer as a common fraction. Answer: The probability of choosing the 2×2 tile is 4/13 and the probability of choosing the 3×3 tile is 9/13. Expected area = 4*(4/13) + 9*(9/13) = 97/13. Nov 27: Gwen randomly draws a card from a deck of 40 cards numbered 1 through 40. What is the expected value of the number on the card she draws? Express your answer as a decimal to the nearest tenth. Nov 28: Luke paints each face of a 5 × 5 × 5 cube red. He then cuts the cube into 125 unit cubes and randomly chooses a single unit cube. What is the expected value of the number of painted faces on this unit cube? Express your answer as a decimal to the nearest tenth. Nov 29: In each round of a particular game, Dinara can win at most one point. If she has a 70% chance of winning a point in each round, what is the expected value of Dinara’s total score after three rounds? Express your answer as a decimal to the nearest tenth. Nov 30: Jo and her four friends each secretly pick a random integer from −5 to 5, inclusive. What is the expected value of the sum of the five chosen numbers? Dec 1: Allen randomly distributes 1000 jelly beans into 10 jars lined up in a row from left to right. What is the expected value of the number of jelly beans in the leftmost jar? Nov 18: Merri places weights of 6 units and 28 units on the right side of a balance and weights of 3 units and 19 units on the left side. If she adds an object to the left side that makes the balance level, how many units does the object weigh? Nov 19: The weight of a small clip is 2/3 the weight of a large clip. If 2 tacks weigh the same amount as a large clip, how many tacks weigh the same amount as 12 small clips? Nov 20: On the planet Klem, 1 Bem plus 7 Dems equals 4 Pems, and 2 Bems plus 1 Dem equals 1 Pem. How many Dems equal 7 Bems? Nov 21: If a race car is traveling at 99 mi/h, how many meters does it travel in a second, given that 0.305 meter = 1 foot? Express your answer as a decimal to the nearest tenth. Answer: 99 * 5280 * 0.305 / 3600 = 44.3 m/s. places weights on either side of a balance, what is the smallest positive integer number of grams that he cannot measure with this set? Nov 24: If Clem has 2 cups, 7 pints, 8 quarts and 11 half-gallons of lemonade, how many total gallons of lemonade does she have? Express your answer as a mixed number. Week of Nov 11 – Nov 17: Selected problems from AMC8 2014. Since we haven’t practiced geometry so much this year, I’m including more geometry problems here. Click GoogleForm to submit answers by Sat, Nov 17. Nov 11: Isabella had a week to read a book for a school assignment. She read an average of 36 pages per day for the first three days and an average of 44 pages per day for the next three days. She then finished the book by reading 10 pages on the last day. How many pages were in the book? Nov 12: Eleven members of the Middle School Math Club each paid the same integer amount for a guest speaker to talk about problem solving at their math club meeting. In all, they paid their guest speaker . What is the missing digit A of this 3-digit number? Answer: D. The number is a multiple of 11. Nov 13: In , is a point on side such that and measures . What is the degree measure of ? Nov 14: Rectangle ABCD and right triangle DCE have the same area. They are joined to form a trapezoid, as shown. What is DE? Answer: B. CE = 12, CD = 5, DE = 13. Nov 15: Four children were born at City Hospital yesterday. Assume each child is equally likely to be a boy or a girl. Which of the following outcomes is most likely? Nov 16: Rectangle has sides and . A circle of radius is centered at , a circle of radius is centered at , and a circle of radius is centered at . 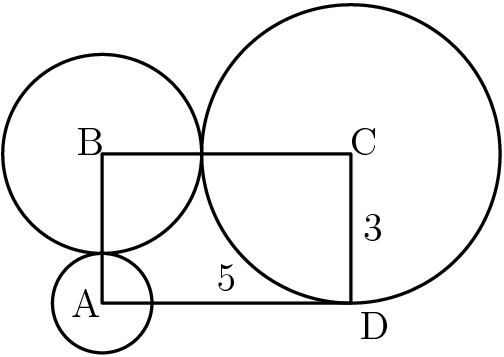 Which of the following is closest to the area of the region inside the rectangle but outside all three circles? Nov 17: Three members of the Euclid Middle School girls’ softball team had the following conversation. Answer: A. 20<A+C<B+C<A+B<32. Therefore, C<A<B. The only prime C can have is 11. Week of Nov 4 – Nov 10: Selected problems from AMC8 2016. Nov 4: Four students take an exam. Three of their scores are and . If the average of their four scores is , then what is the remaining score? Nov 5: Which of the following numbers is not a perfect square? Nov 7: Karl’s car uses a gallon of gas every miles, and his gas tank holds gallons when it is full. One day, Karl started with a full tank of gas, drove miles, bought gallons of gas, and continued driving to his destination. When he arrived, his gas tank was half full. How many miles did Karl drive that day? Nov 8: An ATM password at Fred’s Bank is composed of four digits from to , with repeated digits allowable. If no password may begin with the sequence then how many passwords are possible? Nov 9: The least common multiple of and is , and the least common multiple of and is . What is the least possible value of the least common multiple of and ? 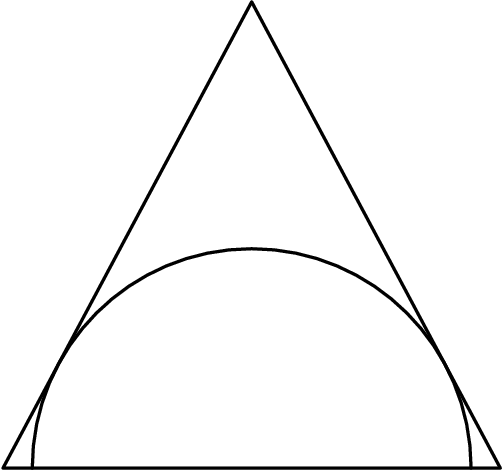 Nov 10: A semicircle is inscribed in an isosceles triangle with base and height so that the diameter of the semicircle is contained in the base of the triangle as shown. What is the radius of the semicircle?